Determined by the recycling market and whatever colour(s) are available at production time. The Cora Ball is currently available in baby blue (instead of the yellow seen in the pictures). Helps to keep our oceans clean! Buy 2 or more Cora Balls, and shipping is FREE! The Cora Ball is now available in Canada (exclusively through Ahimsa Eco Solutions)!! Durable—it will last for over 5,000 washes! Super easy to clean! When you see bunches of lint, move the stalks to the side and remove the fibers. Recyclable, but please don’t put it in your recycling bin at the end of life; instead, contact Cora Ball (info@coraball.com) to make arrangements for reusing the material to make new Cora Balls! Love this product, it works wonderfully and strong too. It was a big eye-opener to learn what our laundry does to the ocean and I am a big fish eater! So happy I found a product I can use in a regular basis to help our ocean clean! Why is the price higher in Canada than in the US? Bringing the Cora Ball into Canada to make it available to you means importing, and importing means fluctuating exchange rates, shipping costs, import taxes/duties (which you’d also have to pay if purchasing from the US), and potential delays in customs. We know that, just like us, you care about the planet so we purchase in bulk to reduce carbon emissions! To further reduce the product’s carbon footprint, you can also buy your Cora Ball(s) at a green retailer. Contact us to find a Cora Ball retailer near you! Anyone! The Cora Ball will work in any washing machine (front loaders and top loaders). 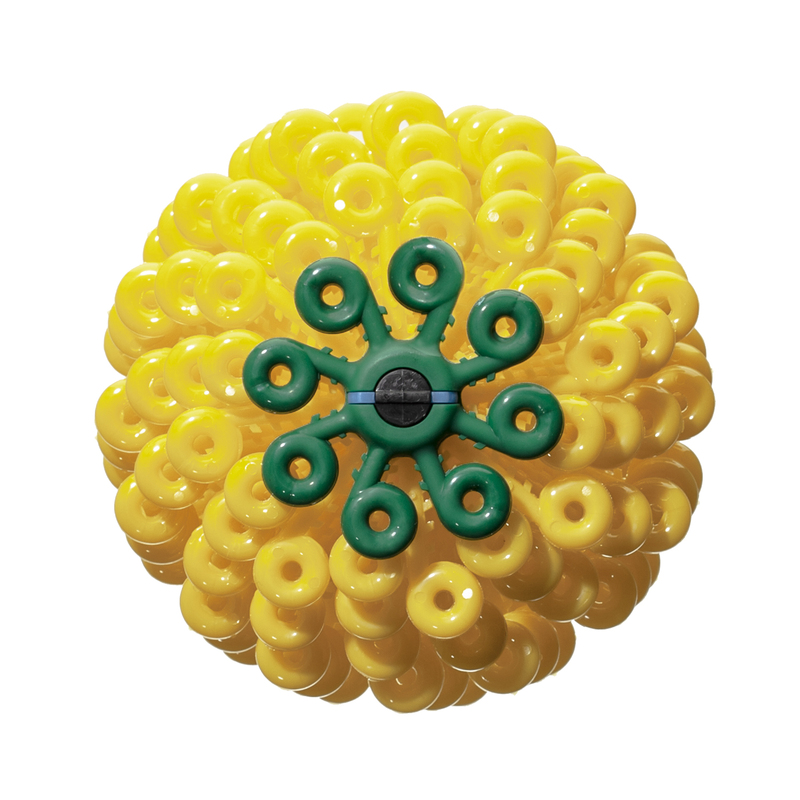 Where can I get a Cora Ball in Canada? You can buy a Cora Ball online at ahimsaeco.com/shop! You can also buy the Cora Ball at local green retailers throughout Canada. We announce new retailers and other Cora Ball partners through our mailing list, Instagram, and Facebook. Be sure to sign up for our mailing list so you can be the first to know of any news, events, and promotions/sales! Can I wash all of my clothes with it, even delicates? The stalks on the Cora Ball might catch delicate fabrics like lace, tassels, crocheted/chunky knits, or items with fraying threads—it’s best to wash your delicates (which don’t contribute much microfiber to the wash water) in a mesh laundry bag, or remove your Cora Ball if you don’t have a mesh bag. A bra or bikini strap may sometimes wrap around the Cora Ball, but don’t worry; it’s easy to unwind and unless the straps are made of lace, they’ll be fine. The Cora Ball has been tested with delicates for over a year and except for lace, has not damaged the clothes. How many Cora Balls should I use? For most homes, one Cora Ball will do the job. For families, especially with a large washing machine, up to three Cora Balls are recommended. How much fiber does it collect? hair and fur (the presence of hair or fur helps to catch fibers!). Can I see the fibers it collects? On the days you wash your heavier items (like fleece or sweatshirts), you are likely to see the fibers stuck in the Cora Ball. Sometimes, after everyday clothing loads, you may not see much. It may be there accumulating and tangling up with hair and larger fibers, but it’s just too small to see and you will be able to remove it when the tangles get big enough to grab. How does it catch tiny fibers? The fibers tend to tangle together into fuzz balls that you can see and pick out of the Cora Ball. Do I have to clean it after every wash? No. 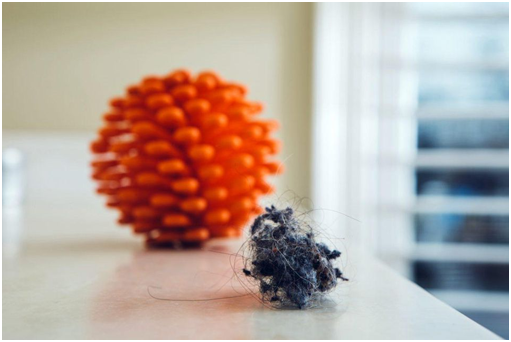 You just have to clean the Cora Ball when it’s easy to do so (like when you see big tangles of hair and fiber). When you have tangles big enough to grab, just move the stalks to the side and pinch the tangles to pull them out. They come out easily. Where do the fibers go? The only option at the moment is to put the fibers in the garbage, along with your dryer lint—they’re the same thing. At this point, laundry lint (from the washer or the dryer) can’t be recycled, but the makers of the Cora Ball are working hard to figure this out. We look forward to the day when we can upcycle all of this material into new clothes or something durable and long lasting. 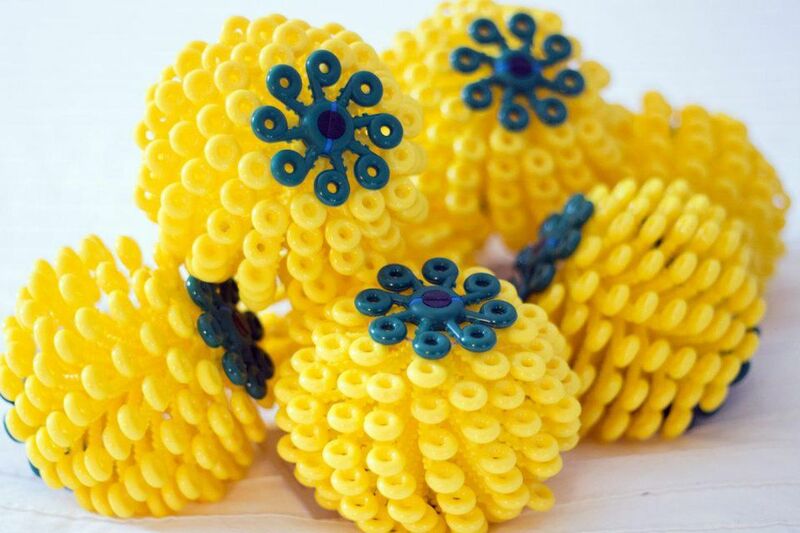 The Cora Ball is a convenient way for every household to help capture microfibers. Otherwise, all of these fibers will be flushed away with our wash water, eventually ending up in our oceans. 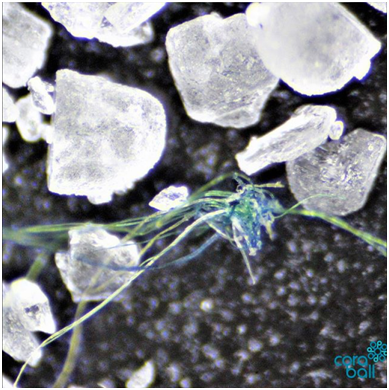 With the Cora Ball, we can intercept these fibers and keep them out of our waters by instead sending them to landfills (which have special liners that keep the waste from entering the streams and groundwater). 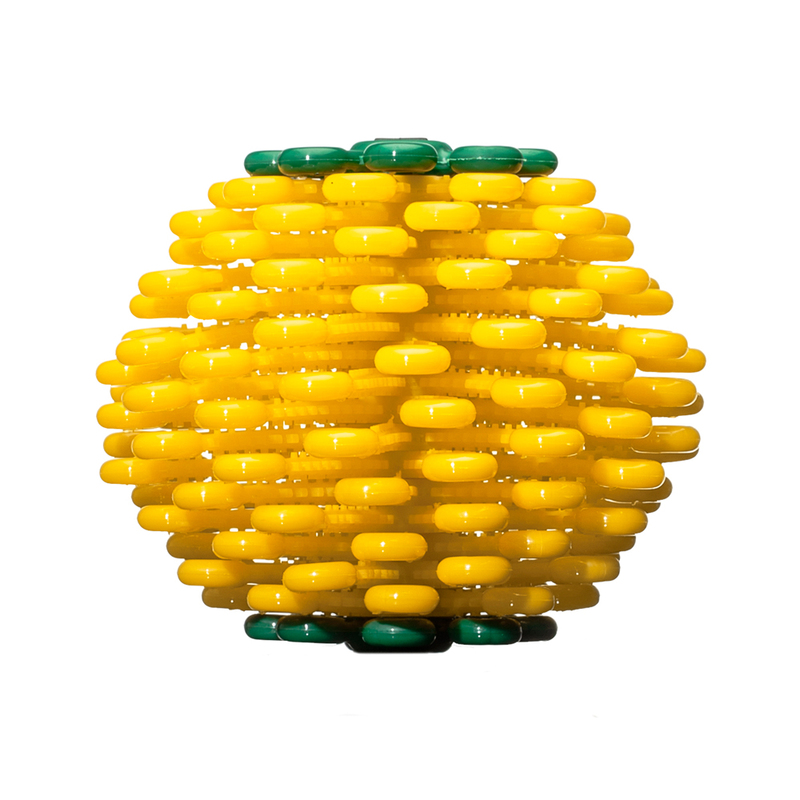 What is the Cora Ball made of? The Cora Ball is made of 100% recycled and 100% recyclable soft and stretchy plastic that will maintain its physical and chemical properties in the temperature extremes of both residential and commercial washers and dryers. All of the plastic used is incredibly durable, of the highest quality and sourced right here in North America. How long will my Cora Ball last? The Cora Ball is designed to last for approximately 5,000 washes—that’s years and years of washing and catching microfibers! It was designed as a long-lasting and durable product, not for just a few uses. Is the Cora Ball recyclable? Yes! While the Cora Ball will last for years, once it has reached the end of its life please please don’t put it in your recycling bin. Instead please contact us because Cora Ball has a recycling program where they will collect discarded Cora Balls and reuse the materials for making new ones. Does it damage the clothes or make more microfibers? Material: the material is extremely soft and stretchy—softer than some of your clothes! Motion: the Cora Ball moves with your clothes around the wash, not against them. 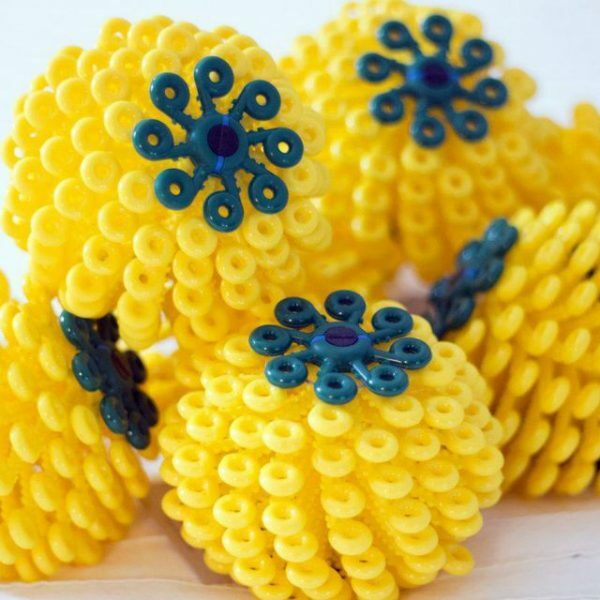 The items that do have potential to get past the rings and stuck in the stalks are: lace, crocheted/chunky knits, tassels or items with fraying ends. For these items, we recommend that you put them in a wide mesh bag for delicates. Can I put the Cora Ball in the dryer? Yes, you can. If you accidentally throw your Cora Ball in the dryer, fear not! It’s made of a material that can withstand the heat and action of a dryer. We are doing all we can to help find the cheapest (and reliable) shipping available. And we offer FREE SHIPPING on all orders (within Canada and the US only) over $75, so if you buy two (or more) Cora Balls, shipping is free! You can also buy the Cora Ball at local green retailers throughout Canada. We announce new retailers and other Cora Ball partners through our mailing list, Instagram, and Facebook. Be sure to sign up for our mailing list so you can be the first to know of any news, events, and promotions/sales! Are there customs, taxes, VAT or other fees for international shipments? There very well could be. We are eager to offer Cora Balls to ocean-conscious global citizens everywhere, but every country has different customs laws. We declare the value that you paid on the customs forms and advise you to look into your country’s policies prior to purchase. What if my package was returned to sender? This can happen in the event that your delivery service deems the package unclaimed (e.g., nonpayment of customs duties or taxes), or if you accidentally provided us with incorrect mailing information. If this happens, we are happy to re-ship your Cora Ball(s) to you. We will email you a link for re-shipping fees. If you know you are going to be away when your Cora Ball is likely to arrive, we recommend making a plan for someone to collect your package. My tracking number says delivered, but I do not have a package. What do I do? Unfortunately, this can happen if the package is stolen or delivered to the wrong location. If the post office has delivered your package but it has gone missing, please follow up with the credit card company you used to purchase your Cora Ball(s). It will often replace the goods you purchased in the event of theft or loss.